If you want the freedom to quickly increase your hair volume and length with zero hassle, but without the temporary status of clip-in extensions, AiryHair tape-in hair Does your hair seem too short and thin? Do you lack volume and shine? 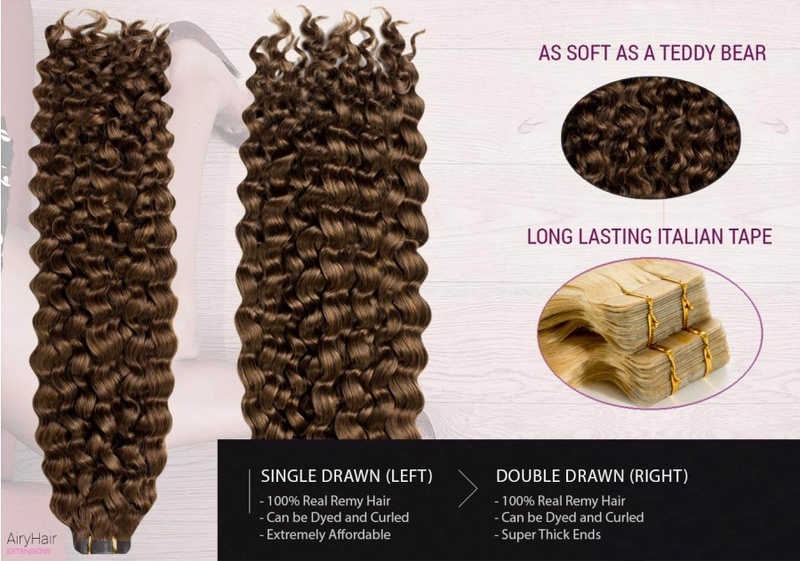 With professional body wave tape extensions, you can forget about waiting for your strands to grow or unsuccessfully trying to make them look denser because you get instant length, incredible volume, and a movie star look. If you’re looking for extensions that will be more permanent and that you won’t have to take off every night, you will love our tape-in hair extensions. Unlike clip-ins, they are taped to your strands and stay there until your hair grows out. One of the many advantages of professional tape extensions is how easy they are to install. There is no need to go to a salon because you can do it at home, all by yourself. That way, you save money and time. Even if you’re new to the extensions world and have never applied them before, you will be able to install tape-ins in about half an hour. So don’t hesitate and try out our extensions now! Another thing that is so special about our tape-in extensions is that we offer you custom textures like a body wave. That way you can blend perfectly with your wavy strands or go for a new look. Either way, professional wavy extensions fit seamlessly and look stunningly beautiful. Not only will your locks look more dense and voluminous, but you won’t have to spend a lot of time on styling. A body wave looks perfect the way it is so you can forget about curling your strands or creating intricate hairstyles, it’s enough to let the waves flow and you’ll look like a million dollars! So if you’re the type of busy girl who always wants to have her locks ready to go, give body wave extensions a shot. You will be amazed how fancy and glamorous they look. 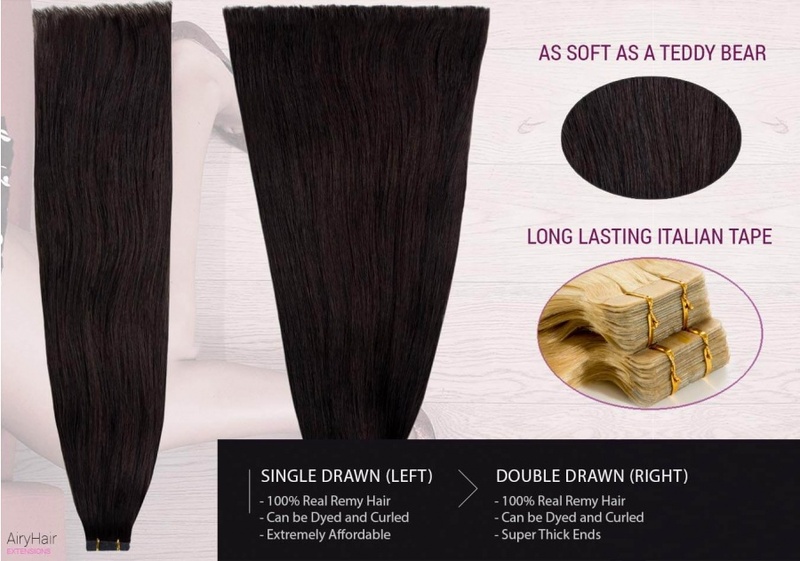 Our body weave tape-in extensions are made out of best quality human hair. That means the tapes will be completely indistinguishable from your natural locks and nobody will even doubt that it’s not your real hair. If you take good care of your tape-in extensions, you can wear them over and over again. Over the last couple of years, the tape-in extension method has become more and more popular. The reason for that is obvious; they are affordable, very simple to apply, last for a long time, and hold up pretty well. Girls have been going crazy over tape-in extensions and even the most demanding customers find them more than adequate. Unlike clip-ins that are in the form of wefts, tape extensions come in twenty to forty thin strands (depending on the weight you choose). So you have the option to go for normal density, or extra volume if you choose to put more strands in. Each strand has a tape with double-sided glue which makes them very easy and straightforward to apply. We recommend this extensions method to girls with thin hair because tapes are easy to mask and because they don’t put a lot of strain on your real strands. Another reason why tape-in extensions are so popular is the easy removal. You may wonder does the adhesive damage your hair, and the answer is no. There is absolutely no harm. We pride ourselves on creating top quality, professional extensions made out of genuine Remy hair that is collected from human donors. 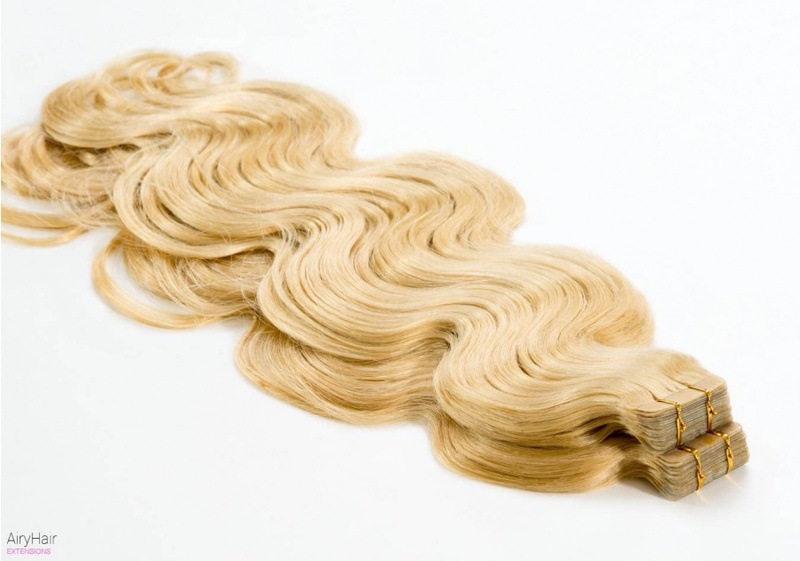 You will notice that the locks are so soft and silky and have that lustrous quality. The waves have an amazing texture that will stay the same no matter how many times you wash them. We also offer invisible tape that will be undetectable on your head and blend perfectly. The lengths you can choose from go from 10 to 30 inches so you have the option to make a real statement with your new wavy locks. 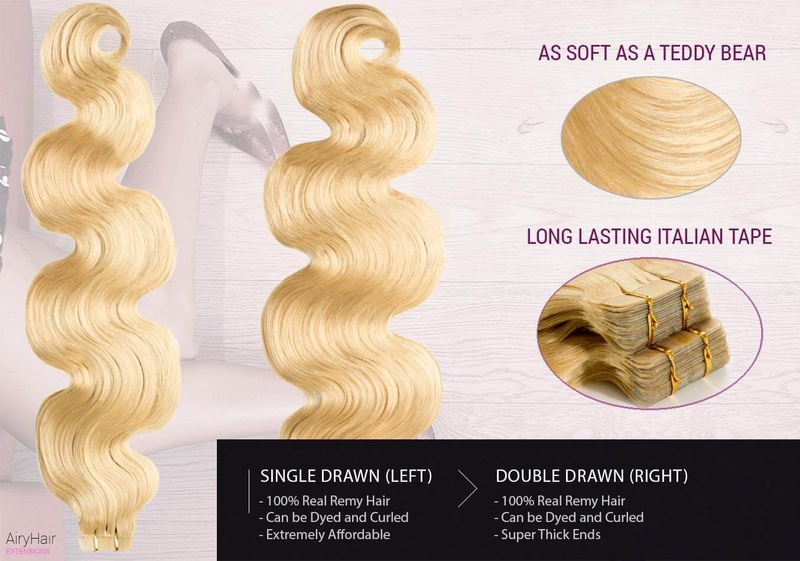 If you want to know more about AiryHair body weave tape-in extensions, you can take a look at the frequently asked questions. How to Apply Body Weave Tape-In Hair Extensions? It might seem complicated, but installing professional body weave tape-in extensions is actually very simple and doesn’t take a lot of time. Why spend money in a salon when you can do it at home? If this is your first time applying tape-ins, you might want to ask a friend for help if that will make the process easier for you. So let’s get started. 1. Before we start the installation process, you need to make sure that your natural strands are ready. We recommend that you wash your locks with a regular shampoo and also apply a leave-in conditioner. Thoroughly brush and detangle your strands and dry them. If your hair is not naturally wavy, create a body way by using a curling iron, straightener, or rollers. 2. Remember that you have to place all the tapes in a brick laying pattern, so keep that in mind as to not get confused during the application. 3. Section off your strands so that there’s only a thin layer at the bottom while the rest is clipped. This is where you will start taping. 4. Take one tape in extension and place in between two of your natural strands. Imagine that you’re making a sandwich; one layer of your hair, one tape in extension in the middle, and another layer of hair on top of it. 5. Make sure not to place the tapes right next to your scalp, leave a bit of room. You don’t want to put too much pressure on your roots. 6. Continue placing the tapes, going up, and sectioning off the hair as you go. There should be some space between the tapes and just keep up the pattern. 7. When you reach the top layer of the hair, be careful where you put the tapes because you don’t want them to be visible. There should be enough strands at the top to cover them. 8. You’re done! Congratulations, you have just installed your body weave tape-in extensions! How to Remove Wavy Tape-In Extensions? To clear up any confusion, although tape-in extensions are considered to be a more permanent method, that doesn’t mean you won’t have to refit them. As your locks grow, the tapes grow along with it and eventually become visible. That’s why you need to remove and reapply our professional extensions every couple of months, depending on how fast your hair grows. You don’t have to purchase new tape-ins, you can use the same ones. The way that tapes are removed is by applying an adhesive remover. The tapes come off easily and you remove any glue residue by brushing your hair. The process doesn’t take more than 15 minutes and it’s even simpler than the application. What is Remy Premium Hair? How Should I Care for Tape-in Hair Extensions? How Are Hair Extensions Shipped to Me?